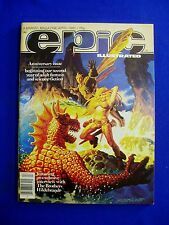 Epic Illustrated 4 Winter 1980. Condition is very fine minus (vfn-: rubbed at top of spine). In general it is a nice comic. A comic, paperback, or hardcover that has been read but looked after will often be in this grading and it is in my opinion a very collectable grade. April 1981. Condition is very fine minus (vfn-: tiny split at the top of spine). In general it is a nice comic. A comic, paperback, or hardcover that has been read but looked after will often be in this grading and it is in my opinion a very collectable grade. 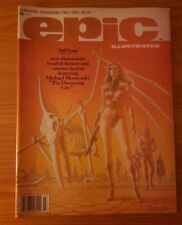 This issue features contributions from Carl Potts & Dennis O'Neil & Terry Austin & Marie Severin, Pepe Moreno & Archie Goodwin, Bo Hampton & Garret Lavin, Jo Duffy & Kent Williams, Vaughn Bode & Mark Bode, Barry Windsor-Smith & Jeffrey Jones & Robert Gould, Rick Veitch, Dennis O'Neil, Jon Jay Muth, Pat Boyette, and Jean Bello. VG condition - 100 pages - contents picture attached - slight spinal stresses - small tear at top of spine. VG condition - 100 pages - contents picture attached - small tear at top of spine. 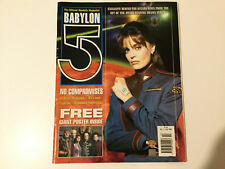 VG /FN condition - 100 pages - contents picture attached. Many of the photos are full-page color. Published in 1983 by Paradise Press. English language. Great for Star Wars collectors, fans of the film, or any one interested in movie art, special effects, etc. Published in 1980 by Paradise Press. English language.